Vietnamese pork roll in Sydney. We are introducing Vietnamese food culture the way we remember best. Sharing our childhood memories of freshly textured food that our mums always put on the table. Reproducing balanced dishes that we have loved in Saigon markets, and revamping the delicious Vietnamese classics that have evolved over decades of French colonisation. 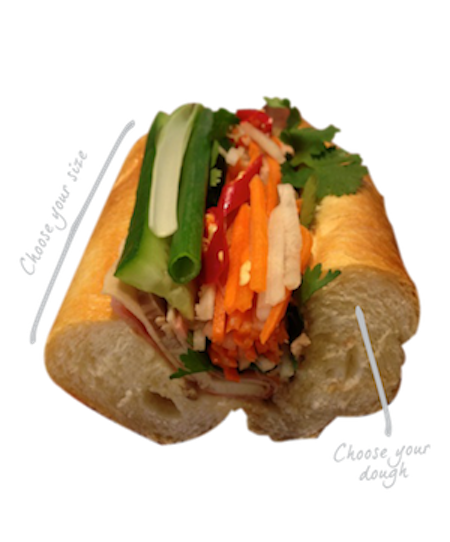 Most importantly, we are shining a bright light on the infamous Vietnamese Pork Roll (Bánh mì). Eat our rolls and taste the French cuisine influences harmonised with the freshness and texture of Vietnamese cuisine. Like raising men there is an art to rising dough. Rolls Vietnam began 3 generations ago with the Tu family first opening a bakery just outside of Saigon during the Vietnam War. The Tu’s had a family of 9 sons and in 1979 they left their town and Vietnam as refugees in search of a more prosperous future. The Tu’s story is one of resilience, hardwork, family and modern day cultural preservation through their craft as Vietnamese bakers. Authenticated in their countless family stories from their home town in Vietnam to crossing the precarious and pirate plagued Pacific Ocean. Initially opening shopfronts in New Zealand and now every member living and baking in Australia, each Tu so pleased to call this land their home. Being the child of a baker, the Tu family each recall “the whole world seemed to revolve around the bakery’s counter”. So it’s not that surprising for a kid or two, to one day follow in dad’s footsteps. It’s definitely remarkable however that all 9 sons chose to do so and are all bakers today! Baking is so intrinsic to the Tu’s day-to-day lives (even in the Tu’s 3rd generation) that on the day of Peter Tu’s birth (Co-founder of Rolls Vietnam) his father was busy kneading the days dough in his Bondi bakery one morning in1986 when he received the call that his wife had begun labour and that their very fist son was on his way! He rushed his wife to Westmead hospital and while anticipating Peter’s imminent arrival in the corridors Raymond was always conscious of his need to return to that rising dough! This is one of Loi’s (Founder of Rolls Vietnam), Peter’s uncles favourite stories, because when Peter’s dad did return to his bakery he found that the dough had risen, and risen and in fact had blossomed so large it had rolled off the counter and was creeping towards the very door Peter’s dad had entered. With 50 years in the industry, The Tu’s are passionate about reproducing authentic, balanced dishes that the family loved so much from their Saigon markets. Revamping the delicious Vietnamese banh mi ‘classics’ to their Australian market today is exactly the business that Peter Tu and Loi Tu are in. And these men are making it their business to be the best.